Discussion in 'Reef Chronicles' started by saintsreturn, Nov 27, 2015. Alright guys, after watching your tanks make awesome progress I just couldn't take it anymore. 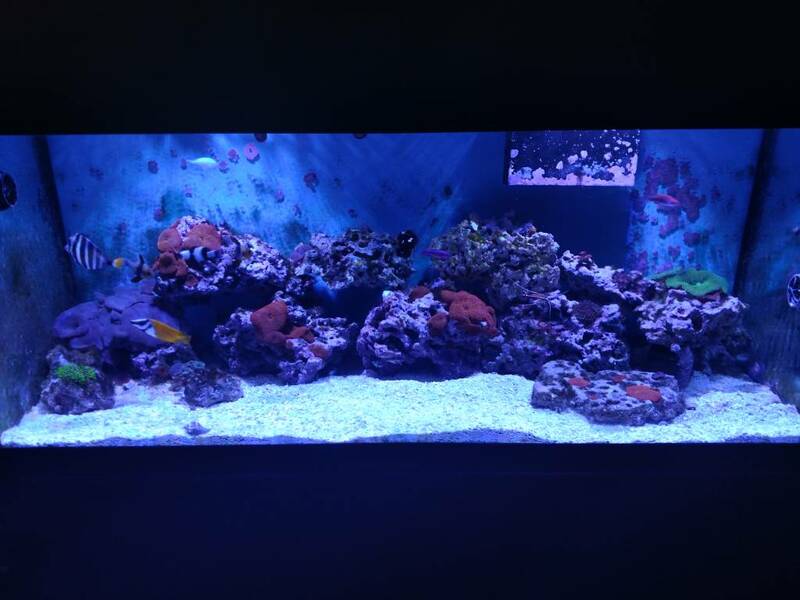 My other build thread will stay alive for now as I am going to run both systems and transition slowly, but here is the first shot of my new 75gallon. How do I decide which way to go for filtration. I want a refugium but I am not drilled and have never had one. I know I don't want a hang on back again... So.... Any thoughts? Pat24601, Oxylebius and nanoreefing4fun like this. Congrats on the new tank saint - look forward to following your new build ! well I got her home and we need to figure something out with the height. We want to make it about 8 inches taller and look like it's supposed be that height. Pat24601 and nanoreefing4fun like this. Alright guys, turns out I need help. I have been searching and reading for hours. I want a sump but don't have the coin. I am thinking about a canister filter. I already do work on my 30g with a HOB so I don't anticipate an issue for now. Is a canister sufficient until I build a sump later? Sump is cheap honestly, when I had my 75g I ran a 20L($30ish) plus a few(6) baffles at about $1 a piece...don't rush anything don't waste your money on a canister filter if you're going to sump it. Simply save n than spend; anything good in this hobby is not going to be cheap unless it comes from a friend. Clint24, soco, cracker and 3 others like this. Where do you get sumps at that price? soco and nanoreefing4fun like this. Never mind. 5 or 10 gallon tank. Can't wait to build that! Your setting up a larger tank. I would skip the canister filter and go right to a sump. Many people build sumps out of a smaller tank. You can often find smaller tanks on sale at $1 a gallon. For powerheads, get what is know as circulation pumps. They will give you a lot more flow. Consider lighting, especially LED lighting, carefully. It is critical to understand what your trying to do with the system. LED lighting can get expensive fast, and you only want to buy it once. There are also pros and cons to a deep sand bed. Keep in mind that there are all sorts of great reef systems out there, some use a DSB, some use a minimal sandbed, others are bare bottom. Again, this all comes down to what you want out of the system. As for fish and corals, this comes down to what you want to keep in the tank. After all, it's your tank. My thoughts are that you want to select each item as part of how it will fit into your reef plan. Often one choice will exclude others. Also choose each item for how it's going to look in the tank. You want everything to be a "real gem". Wrangy, saintsreturn, Oxylebius and 1 other person like this. Petco has sales a couple times a year where they sell tanks at a price of $1/gallon. So a 40g breeder would end up being a $40 tank. 1) if I drill my tank and add an overflow box, how do I get water back in the tank? Is it as simple as just a down pipe into the tank? 2) how can I be sure the tank will support a custom built hood that hinges and holds my LEDs? Excuse the mess but I actually like the way this canopy looks. That said I already see what I will be doing differently when I build mine down the road. It is a nice canopy! Did kids put the stuffed animals in? Thanks for the comment. I am excited to hide everything with it and all ready designed a way to put light diffusers in it without blocking my light output. Lots of little projects coming about! nanoreefing4fun, Oxylebius and Pat24601 like this.